Given an array of N integers, computing the minimum over the whole array is an easy operation requiring N steps. For example, one can take the first value as a tentative minimum, and iterate through the array comparing the tentative minimum with the current value. Any time the current value is smaller than the tentative minimum, it becomes the new tentative minimum, until the end of the array. The brute-force approach would be to compute the minimum element for any given range. The Range Minimum Problem (RMQ) is about finding a more efficient solution to this problem. How can one do better than O(N)? One obvious way would be to pre-compute the minimum of sub-arrays and sacrifice space for performance. But, wait a moment, how many possible sub-arrays can be defined given an array of size N? Given an array of size N there are N sub-arrays of size 1, N-1 sub-arrays of size 2, N-2 sub-arrays of size 3 (…), 2 sub-arrays of size N-1 and 1 sub-array of size N.
We are now approaching the end of this article. I hope you had a good read. 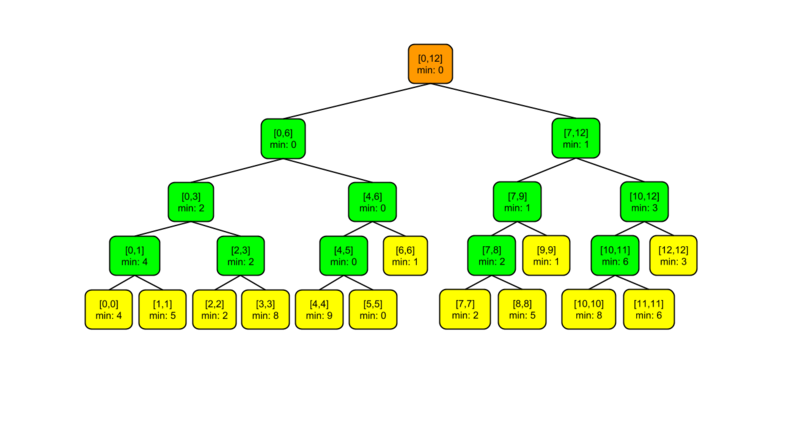 To conclude, I would like to draw your attention to the fact that the depth of the Segment Tree is only Log2(N)+1. This clearly implies that a Segment Tree can be visited very efficiently with a moderate number of recursive calls.